The DIM Hypothesis by Leonard Peikoff. I just started reading the book, so I can't rate it yet. But I found this interesting statement in the Preface concerning his lecture course on DIM and Dr. Peikoff's attempt to use them in his book. I gave fifteen weekly lectures by telephone to some interested students around the country and was happy with the results. ... Far from "smoothing out" in the end I had to throw out all fifteen lectures; not a single page could be used. Thinking the issues over methodically and as (rational) devil's advocate, I came to discover how much the initial material suffered from omissions of the indispensable, inclusion of the unnecessary, outright errors, and a lack of full clarity so pervasive as to be traumatic to me. Concerning the arguments and discussions that went on here on The Forum back in 2007, I think that quote is appropriate to get us started with another discussion. I have the book on order and should be getting it any day. I'm interested in seeing how Dr. Peikoff now answers the questions I had about his original lectures back in 2007. Thanks for linking to that old discussion, as it is very interesting to reread that old thread and analyze some of the predictions in light of what has actually happened in the United States. To put it simply, in every instant I can think of and have found, every one of Peikoff's predictions based on DIM could not have been more spectacularly wrong. His characterization of the environmentalist movement as a relatively harmless D1 compared to the M2 Christian G.W. Bush was completely wrong, and more damning was the prediction that environmentalism would not be able to significantly influence society because of its supposed disintegrated nature. Fast-forward a few years, and environmentalism has become one of the defining aspects of our culture: it has beens smuggled into our ethics, our economics, and our politics. It's bad enough to have a pseudo-numerologist theory where dis/mis/integration are assigned quantitative designations without any clear justification, but then to make bold predictions based purely on these voodoo-quantitative classifications and to not apparently be concerned that such predictions contradict mountains of observational evidence is simply piling layers of rationalism. What possible value do the members here hope to obtain from a theory that has not been able to make a correct prediction in the last 6+ years? Dr. Peikoff did admit, in his podcast of May 17th, 2010, that he was wrong about the Democrats and the harm they could do. At that time, he said of the Democrats, "These are people methodically destroying the United States at home and abroad much more extremely -- I mean to a much greater extent -- much more rapidly than I expected." But he also said at that time: "Now for years I have said: Don't ever vote Republican. They are the greater threat by far. Religion is going to destroy this country and I don't deny that. And my book when it comes out, The DIM Hypothesis, is going to defend that." Now he says: "Thinking the issues over methodically and as (rational) devil's advocate, I came to discover how much the initial material suffered from omissions of the indispensable, inclusion of the unnecessary, outright errors, and a lack of full clarity so pervasive as to be traumatic to me." That being the case, I would like to read the book and see what his current position is and the reasoning behind it. I still find this hard to believe that he holds this. If any religion is a threat, it is Islam. It has taken over several European countries (intellectually) within one generation. But I'll wait till I see his evidence in the book to see if he can change my mind. But the nature of his admission further confounds an already confusing situation, and simply raises more concerns about his epistemological theory, both in terms of the validity of his theory and his own intellectual rigor in developing it. For example, notice the astonishing fact that his arguments in favor of voting for Republicans over Obama were based purely in terms of political policy and weighing short-term vs long-term risks. 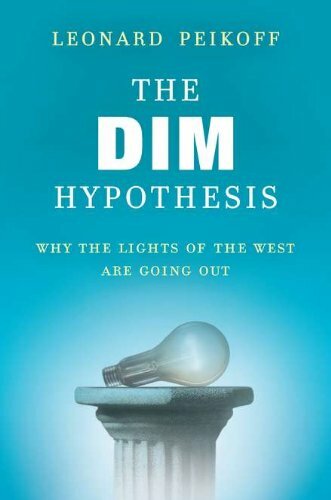 The DIM hypothesis was never referenced, nor was anything of philosophy, much less specifically epistemology. It was simply an analysis of some political facts, the very kinds of facts that were either ignored or not considered relevant enough back when he was making predictions based on the abstract theory of the DIM hypothesis. What use is the DIM hypothesis then, if simple facts are more useful for making decisions on who to vote for? He can't simply say that simple facts are used to assess short-term risks, while DIM is used to assess long-term culture change, because "short-term" and "long-term" are rather arbitrary, and it would need to be rigorously explained in terms of the theory what "long" and "short" mean exactly and how that delimits the application of the theory and the evolution of our culture. Secondly, if a theory is robust then it should be explainable why it fails in certain situations. No person who is seriously developing a theory would so lightly address a failure in the application of the theory, especially when it is this spectacular and concerning predictions that were made so boldly. Was the failure due to a weakness of the theory, or due to misapplication of the theory? These are serious questions that deserve answering. When a theorist's predictions are wrong this should sound alarm bells in his mind that something in his ideas may be flawed and careful scrutiny is warranted. If the theory has any chance of being preserved after failing in such a way then the incorrect predictions need to be rigorously explained. If the theory is robust it should be able to explain in terms of its own defining principles or features what went wrong and why, in a way that it can maintain coherence to reality. An "Oh, I was just wrong there" doesn't suffice when it is dealing with something so serious, especially so when it is coming from an authority figure within the philosophy and culture of Objectivism. But this is more a riddle than an answer, and exacerbates the reader's concerns over how serious or methodical or sound any of this is. Furthermore, it's rather irking to hear him unapologetically admit to "a lack of full clarity" during a timeframe when he was making sharply judgmental pronouncements about Objectivists who disagreed with him about the application of DIM to the 2004 elections. None of this makes any sense, and his explanations confound more than explain. Basing one's ideas on principles is one thing, in fact a good thing. It is therefore vitally important that those principles are valid in the face of evidence. Otherwise, it won't just be one thing one gets wrong, but it undercuts all one's judgements. It seems it is very difficult not to embrace rationalization in the face of evidence conflicting an accepted principle. It seems it is very difficult not to embrace rationalization in the face of evidence conflicting an accepted principle. Most people. How else could they live with the contradictions they hold in politics and religion? My comment had more to do with the subject of this thread though. Someone who figured if one didn't vote Democrat, one didn't understand principles, namely the principles of Objectivism. This was justified by another set of principles he had derived from a theory of his. For many critics, the "material suffered from omissions of the indispensable, inclusion of the unnecessary." Of course one could put it down to simple error, and I make no personal accusations despite my suspicions. His theory not only failed to predict the near future, it failed to account for or acknowledge the past and the present. The viro movement had already had a devastating impact for decades before he made his 'predicition' that it would be relatively harmless. In Leonard Peikoff's 2010 podcast he does not admit to being wrong about the Democrats. He said he would vote for a Republican to get rid of Obama only because of a specific emergency stemming from an immediate threat from the Obama administration, which he dismisses as an unanticipated exception to the position he still holds -- and which 'emergency' he does not grasp is a consequence of their political philosophy and goals progressively imposed. To say that he only "analyzed some political facts" is to overstate what he did, which was to in the name of "philosophy" rationalize around random factoids he picked out without the knowledge to intelligently discuss the subject factually at all. The same goes for his previous 'analysis': he does not grasp what a president Gore or a Kerry would have meant in practice and why. Here is a fuller excerpt from his 2010 podcast statement linked to by Betsy in which he reiterates and emphasizes his original position. He recants nothing. His 'admission' of the 'unexpected' from Obama is regarded not as a mistake in principle due to ignorance of relevant facts which as a matter of principle are relevant, but only a matter of application of his original 'position' on how to evaluate elections 'philosophically' without the requisite knowledge. This podcast was discussed on the Forum in relation to his DIM hypothesis here, and a related, earlier 2008 election Forum discussion is here. Republicans are making the chemical nuclear factory, but right now the Democrats have the gun aimed at our hearts. Now that's the only time [i will discuss this], so no use telling me all the things that I've stated wrong, I'm not even supposed to do politics, but I got so many of those I figured, one time only. Notice how he regards the progression of political policy since FDR as if it were only abstract "steps" in the "mixed economy", somehow held in abeyance from potentially meaningful results until sometime in the future, as if these steps had no meaning or impact for real people in reality as they are progressively imposed by force and accumulated by succeeding administrations, becoming worse and worse in practice. This allows him to regard the actions and goals of Obama and "the Democrats" now as some kind of unexpected exception not resulting from their policies and actions in a progression, but suddenly appearing out of nowhere as "death squads" and "immediate death and disaster", and not something his "DIM hypothesis" should be expected to explain. Notice also that he does not want to hear factual corrections from his listeners about his politics, which he regards as of "no use" because he isn't required to discuss such matters -- only, apparently, rationalistically deduce them from his "hypothesis" and a smattering of what he hears on the news. How does he decide what is immediate "enough" to constitute a dire enough threat to change his immediate actions? How is it that these threats were not anticipated? Direct threats are in place and known all the time for people who follow what is actually going on in politics and know what is happening to them instead of trying to deduce it without having to know. You have to know who is doing what and how, and what difference it makes as to who is in power that makes possible or thwarts the efforts of the best and worst people in positions of enforcement and influence over policy. It cannot be deduced or ignored in favor of "long term voting", let alone with false premises about the Republican Party being the voice of theocracy -- not if you want to survive long enough for there to be a long term. This didn't start with Obama. No Objectivist advocates the Republican Party as an ideal. It is always in terms of real world factors of what are the means to effect worthwhile change or stop the acceleration of the worst in order to buy time. He denounced people with such a reality-centered view as not understanding Objectivism and then when confronted with "here now threat" which he did not anticipate, changes his actions while still endorsing the original strategy. Carlos' initial reaction -- "bizarre" -- is, unfortunately, correct. I expect to find interesting observations in the book when I eventually read it, but I don't expect a retraction from the rationalistic approach and disregard for the necessity of expertise in the subjects one discusses and tries to make predictions about. Let that be a warning to not become swept up in the flow of the rhetoric without careful and critical examination -- he said that he made many revisions to improve only the 'smoothness' of the writing -- knowing when one does and does not have the knowledge on any particular topic to know the difference. Amy Peikoff interviews Leonard Peikoff about his new book The DIM Hypothesis on her blog talk radio show. As some of you know, I have been viciously smeared as an alleged advocate of vigilante murder, by such people as Klaus Nordby, his “Checking Premises” gang, and (most appallingly) by someone who certainly should know better, Harry Binswanger. Based on everything I have seen of their writings, they regard obamacare as a simple, mildly objectionable instance of … socialized medicine. I, by contrast, have been screaming at the top of my lungs (on Facebook) that the crucial issue is NOT “socialized medicine” (which sounds almost innocuous). The crucial issue is: MURDER. obamacare = Death Panels = MURDER. When congresswoman Giffords was shot by a madman, I made the simple observation (which should not be controversial to anyone who’s read and accepted the philosophy of The Virtue of Selfishness) that Giffords was worse than the madman. Why? Because she acted to force Death Panels on my loved ones, and on a whole country of helpless victims, “legally” bound hand and foot ; she (along with her accomplices) will soon be killing literally thousands of people per year, for every person killed by the madman. She was speaking there merely of Medicare, not of Death Panels! Saying that Obama and his accomplices in Congress (such as Giffords) who ACTED to establish Death Panels, are NOT murderers, since their victims will die of disease without their actually laying a hand on them, is like saying the Nazis did not murder Anne Frank, since she died of disease; or like saying Stalin and Khrushchev did not murder five million peasants whose food they took away, it was their own hunger that killed them. This is way off topic. Please start a new thread if you want to talk about this. The soundness of Dr. Peikoff's judgement of contemporary politics in America has been questioned. I have sometimes respectfully disagreed with him in the past; but I think my post shows that his judgment on a current life-or-death issue is light-years ahead of some Objectivists (or alleged Objectivists). When there is a myriad of very serious threats to Liberty and the future of the United States as we know it, the fact that he successfully recognizes one of those threats should not be regarded as an intellectual accomplishment or an act of notable judgment. This is especially true given that he's only now recognizing the danger after the fact of Obama's arrival when plenty of Objectivists and others were warning of this danger long before. His acknowledgment of the threat of Obama and government health care is an after-the-fact adjustment of a failed prediction; it's the bare minimum that you'd expect from anyone halfway paying attention to what's happening in Washington D.C. Regardless, when someone sincerely admits they are wrong there is usually an associated apology or humbling that occurs as the natural process of admitting you were spectacularly wrong and unfairly judged many people. That hasn't happened. What he has done is the philosophical equivalent of when global warming climate modelers arbitrarily tweak their models as an after-the-fact adjustment when some new observation is made that spectacularly contradicts their models. They just arbitrarily adjust and keep going, with no recognition given that their theories are not coherent with reality, and are simply giant rationalist edifices floating in space with no contact to reality. I only just started reading The DIM Hypothesis, so I really can't comment on the work. I can only say, right now, that I think Dr. Peikoff is a great man. He elucidates so many of Ayn Rand's ideas--and those of philosophers she would be opposed to, so we can see what they really mean--in smooth, yet stimulating and powerful prose. Laymen in philosophy can read him and understand him. I also admire his dedication to making Ayn Rand's voice heard, ideally for generations to come. I agree that Dr. Peikoff is a great man (or close to it); that is chiefly evidenced by OPAR, and the decades of study and questioning of Miss Rand, and systematizing, that he put into it. However, I have to admit that those who are questioning the DIM hypothesis have made some good points. Miss Rand once said that a novelist, while writing a book, necessarily believes it's the greatest ever written. Probably something similar happens to philosophers coming up with a new theory. The general principle, that how people integrate or fail to integrate affects the course of civilization, is undoubtedly true. You don't have to be a seer to grasp that civilization is deteriorating. But there are specifics, in The DIM Hypothesis, that are open to question in a way that was not true of OPAR. Still, given what Dr. Peikoff has contributed to Objectivism, all criticism should be respectful. The general principle, that how people integrate or fail to integrate affects the course of civilization, is undoubtedly true. Nothing is "undoubtedly true" until it's been rigorously demonstrated to be true with evidence. You don't have to be a seer to grasp that civilization is deteriorating. The deterioration of civilization and the rational recognition thereof by many different intelligent people precedes both DIM and Peikoff himself. The fact of the decline is totally orthogonal to DIM being right or wrong. On the principle of the trader, Peikoff will receive respect from those who disagree with him in accordance to that which he has given them, which is not a lot. I can't personally recall even one instance where he accorded respect to anyone (other than Ayn Rand) who disagreed with him or David Harriman. Anyone know of one? I don't expect a lot from the DIM book given what he has said about it and its applications previously, which have been largely destructive -- and his theory of induction in physics was a negative despite his attempt -- but he has created a lot in his Ominous Parallels, and especially in his past articulation and organization of Ayn Rand's ideas such as in OPAR and including the treatment of other philosophies in his history of western philosophy lectures. Whatever the reasons, his significant contributions were based on discussions and consultation with Ayn Rand, not original ideas or original attempts to apply Ayn Rand's principles in new areas. He continues to have great integrity and great admiration for Ayn Rand, but not always such good judgment. With that in mind, one should always be very careful to evaluate even what he says about what Ayn Rand's own positions were since she died, especially in his original organizations of them or variations formulated without being able to discuss them with her. This includes OPAR. Don't become swept up in the flow of the themes and the style. When evaluating validity of Ayn Rand's ideas, keep the distinction between what she wrote or said and what Leonard Peikoff relays, even when he is right. He continues to have great integrity and great admiration for Ayn Rand, but not always such good judgment. Judgment. A sometimes elusive quality for even the most educated and intelligent. I'm almost at the end of Chapter 12. I think this is an excellent book. The development of his DIM hypothesis is very well done and is much better than the presentation of the recorded sessions 2 years ago. I don't see any trace of rationalism in his methodology. He develops his theory from observation and generalization. I'm looking forward to completing the book within the next week or so. I hope others have read the book and have suggestions for discussion here.